6 Steel Framing Myths Busted! Construction methods are continually improving and whilst we welcome these innovative changes, there is always going to be a list of myths to go with them. Today, we go into some common steel framed myths, and bust them wide open! The most common misconception that arises around building steel framed homes is the noise factor. The truth is, a correctly insulated steel framed home is no noisier than opposing timber framed builds. The reason for noise in your home is due to materials moving which can potentially cause that slight noise you hear inside. Steel frames do expand and contract with heat and cold, but no more than other materials. Steel will also not absorb moisture like timber, which will swell and contract with contact. This means it is highly unlikely you will experience any additional noise in a steel framed home than you would in a timber or brick built home. The truth is, steel is a completely non-combustible material and will not add fuel to the fire. The elimination of combustible materials that can be found in timber frames and roofing can significantly prevent the ignition of a fire. Not only that, but steel can significantly slow the speed in which a fire can spread, reducing the intensity and potential damage a fire can cause. We all know how upsetting a devastating bush fire can be, and how unfortunately in regional areas fire is a large part of our worries. In addition to steel framing providing prevention against bush fires, we recommend reading our article building in a BAL rated area to find out more on how to protect your home at all costs. Evoke Living Homes steel wall frames and roof trusses are made of a galvanised BluScope Truecore steel which is protected with a coating to avoid rust and corrosion. For homes off the coast, or close by to salt lakes, external steel in the form of cladding, gutters and roofing does have the potential to rust over time. In these locations, we build using only Colorbond Ultra Steel. Colorbond Ultra has been designed for coastal and industrial environments, meaning these homes are protected against potential rust and corrosion. The truth is, in many cases, you wouldn’t be able to tell which homes are steel built and which are timber. Evoke Living Homes produce quality built homes that offer almost complete design flexibility. 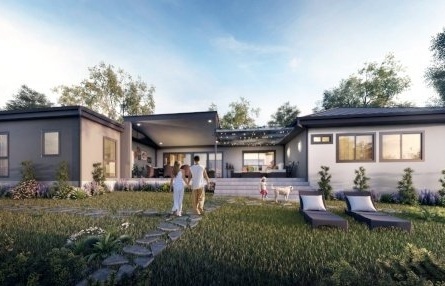 This means, those architectural designs you absolutely love, or the country style cottage you have been eyeing off can be created and customised from a steel framed wall and roof system. If you’re still not sold, check out some of our standard designs and see if you can tell they have been built from steel. A long-standing myth is that steel framed homes are more prone to lighting strikes. The truth is, steel is safer than timber framing as it is a better conductor of electricity and doesn’t allow energy to be dissipated destructively around the frame. This means, if your home is struck by lightning, the electricity will flow straight into the ground without causing damage to the home. Many people believe a steel framed home can interfere with phone and internet reception. The truth is, electromagnetic waves move around steel the same way as they do with wood; passing through the spaces between studs and allowing use on all appliances and devices. This means the performance of your mobile phones, gadgets and WiFi won’t be impacted by living in a steel framed home. So, there you have it, 6 of the most common steel framed myths busted in only a few minutes! If you have any questions on steel framed homes, or would like to chat about some of the other common myths, please contact our team who are only too happy to help.